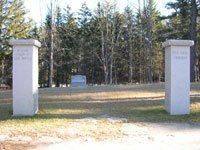 The Beth Israel Jewish Cemetery consists of 96 burial spaces.The Synagogue controls and distributes the burial rights for the burial spaces located in the Jewish Cemetery even though the actual ownership of the land occupied by the Jewish Cemetery remains part of the Bath Municipal Cemetery and is owned by the City of Bath. Directions from the Synagogue: Take Washington Street from the Synagogue to Centre Street. (0.1 miles) Right on Centre St. and continue on Centre St. to Lincoln Street. (0.2 miles) Right on Lincoln St. and continue on Lincoln St. to the stop sign at the Puffin Stop (Mobil Station). (0.5 miles) Continue straight across the intersection marked on the right by the Puffin Stop/Mobil Station. Road immediately becomes Oak Grove Avenue Continue on Oak Grove, past twin stone cemetery pillars (on your left - the pillars mark an entrance to the Cemetery which is NOT the one you want), and then past a small pond (also on your left) until the first dirt road on the left after the pond. (0.7 miles). Turn left onto the dirt road and into the cemetery. Turn immediately left onto the next dirt road and stop about 100 feet ahead, at the Jewish Cemetery, which is on your left.